As I got a little older, about 9 or 10, I’d pick up the phone every time it rang and jump into whatever conversation would be going on. It was usually all in good fun. One of my oldest and dearest friends was also on our party line. I really can’t think of one time that she ever approved either way, but, after all, we were only 10. Today, with Instagram, Twitter, Facebook and a host of other social media platforms, we can have private or public conversations all at the same time. In fact, we can simply watch the conversation play out between others – a sort of 21st century party line that is now an integral part of the 24-hour news cycle. All this makes it easy to find products, make choices, learn new skills and form opinions -- information that we used to get exclusively from radio and television or reading newspapers, Classic Illustrated comic books or the Encyclopedia Britannica. These days, it’s out there for the taking, a click away. What’s more, the information is inexhaustible. Overnight -- or in a minute -- any one of us can be an expert on complex topics like history, physics, chemistry, investments, art, film, travel and food. So how does one stand out on these new platforms. What skills do you need to get started and to keep going? Where do you jump in, how often, and what does success really look like? As it turns out, just about everyone is interested in travel and food. 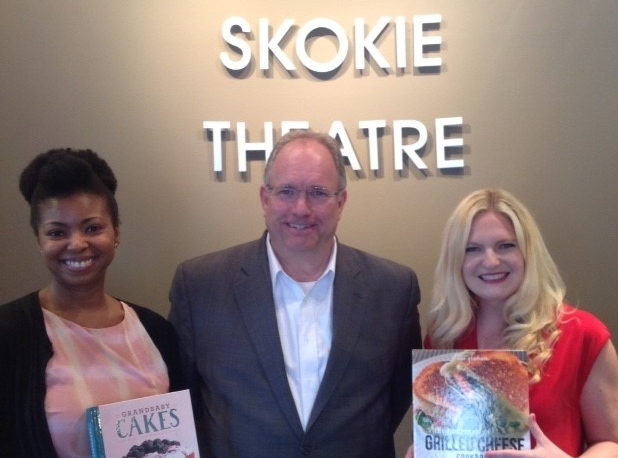 On June 22nd, 2016, at our live Conversation series at Skokie Theatre, we spoke with Kit Graham and Jocelyn Delk Adams who have successfully amassed large and diverse audiences in social media. Their own personal party line reached, at the time, a combined 60K Instagram followers and tens of thousands more on Twitter and Facebook. A year later, their combined numbers are approaching 90K on Instagram and 20K on Twitter. Jocelyn Delk Adams has over 190K followers on Facebook. One of her recipe videos has been viewed by over 2M times and shared to 67K! That’s a lot of cupcakes! Kit Graham is the founder of the Windy City Blogger Collective, a community for bloggers and a networking group in the Chicago area. Her book is The Gourmet Grilled Cheese Cookbook and her blog is hosted at thekittchen.com. At the time of our conversation, Kit had just returned from a trip to Helsinki. Jocelyn Delk Adams is the author of the award-winning and Amazon best-selling cookbook Grandbaby Cakes and the founder of Grandbaby-cakes.com where she gives generational recipes from her grandmother a modern and inspired spin. Jocelyn’s anti-violence dessert fundraiser, A Charitable Confection was produced with some of the top bakeries in Chicago. Her work has been featured in Better Homes and Gardens, Vanity Fair and on numerous broadcast programs including Rachel Ray, the Today Show and many more. She also recently gave a TEDx talk at Columbia College about her journey as an entrepreneur titled Standing in Your Authenticity.